These roasted potatoes only require three ingredients and a quick bake in the oven. No fancy tricks or high maintenance steps required! 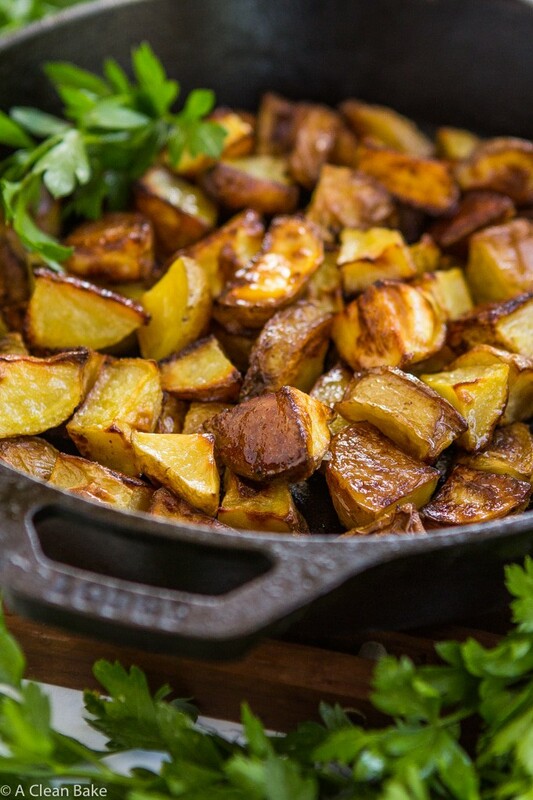 This might just be the perfect roasted potato recipe. It only took me a few decades, but I’ve finally woken up to the seductive nature of potatoes. Sure, when you can choose any food on the planet, you might not reach for a starchy subterranean misshapen lump but sometimes the stars align, the clouds open up, and suddenly you can see it: the one food worth eating. The potato. Roasted potatoes are my new BFF. One completely unexpected consequence of pregnancy was, for me, anyway, the lasting toll it has taken on my senses. 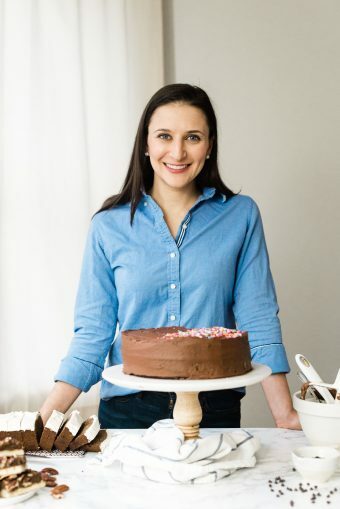 I’ve already told you how I had a tumultuous relationship with food for nearly the entire duration, and though that has improved mostly, there are still a few smells that catapult me back to the worst nausea and I don’t know what they are until I smell them. Case and point: one lavender-scented cleaning product. Not all cleaning products. Not all lavender scents. Just this one. Go figure. But the opposite is also true: whereas I had always been somewhat indifferent to potatoes – “keep your fries, I’ll take the cupcake” kind of indifferent – something inside me became unhinged once I was gripped by a new cocktail of hormones and I was suddenly overcome by a deep love, no, yearning, for potatoes. Fried, baked, mashed, you name it (though mostly fried). Potatoes were the only thing I could manage to eat some day, and I’ll never know why. I’m back to appreciating a good French fry but generally being somewhat indifferent to spuds with one notable exception: roasted potatoes. 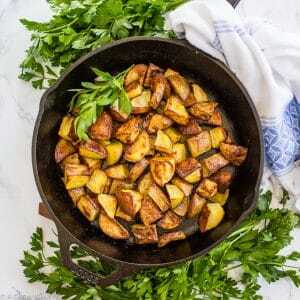 No, I misspoke; perfect roasted potatoes. I’m not even sure how this started – it probably had something to do with the lack of commercial deep fryer in my house – but I made these over and over to achieve the perfect degree of crispiness and fattiness that would rival the most gourmet of pomme frites. Many homemade perfect roasted potatoes require crazy steps like insanely long roasted times or boiling them before you bake, all promising to chemically alter the structure of the surface starches or … something. Look, I’ll concede that maybe these high maintenance methods would make these 0.5% crispier, but once you’ve achieved 99.5%, why spend sooo much more time (and dishes) to get to 100%? You won’t even know the difference. Actually you will: these are real-people-on-a-rushed-weeknight-trying-to-get-dinner-on-the-table grade roasted potatoes. And they’re fantastic. Cut potatoes into into large bite sized pieces (1" or so square). 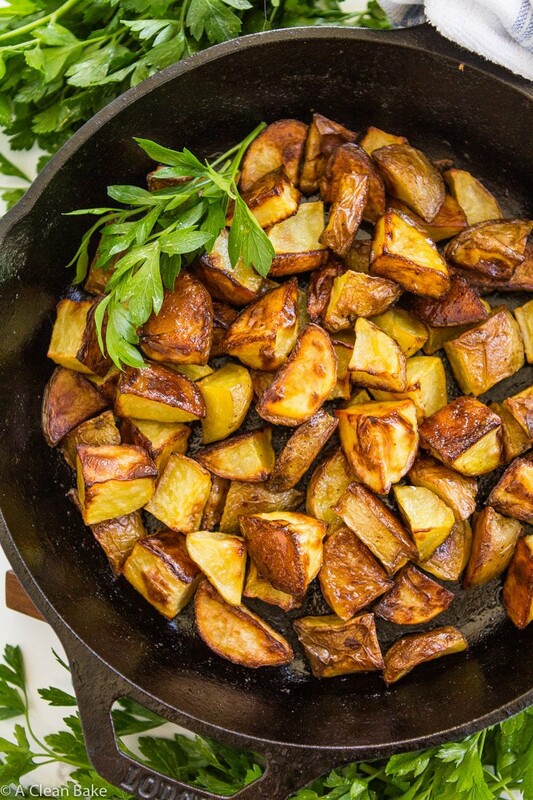 Toss potatoes with olive oil and salt. 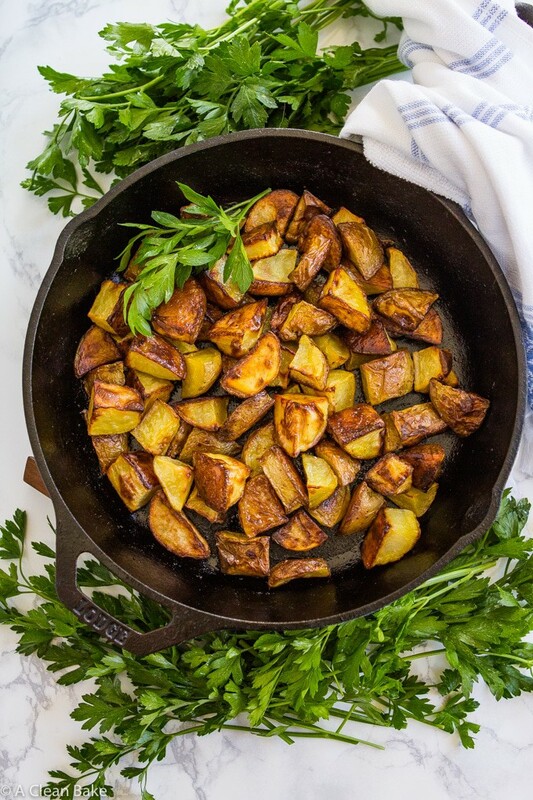 Spread potatoes in a single layer, making sure to leave ample space (about 1/2-1" between each piece), in one or two cast iron pans. If you do not have a cast iron pan(s), use baking sheets lined with tinfoil instead. The side of the potatoes that is face down will brown more quickly, so you may need to check on and turn the potatoes more than once during the cooking process. Make sure you leave as much space between each piece of potato as possible. Use 2 baking sheets if necessary. Having enough room between the potatoes is the key to making them crispy. If they are too close, the moisture each piece releases as it cooks will steam the pieces around it, and it will be harder to get the crispness that we want. They will be at their most crispy right out of the oven, but soften up fast. When possible, serve immediately after cooking. Store leftover in an airtight container in the fridge for up to a week. They'll never be quite as perfectly crisp as when you first pull them out of the oven, but you can reheat leftovers in the oven or a heavy-bottomed pan (such as cast iron) to get a little bit of the crispness back before serving. My family is OBSESSED with perfectly crispy roasted potatoes…seriously, whenever we get together for dinner, it seems like there’s never enough roasted po no matter how much we make. There really is ultimate bliss and beauty wrapped up in the dish. We’ll have to give your recipe a try next time we all get together!